Afternoon everyone! Hope you're having a lovely weekend! Today I have a Make Up Academy polish to show you. 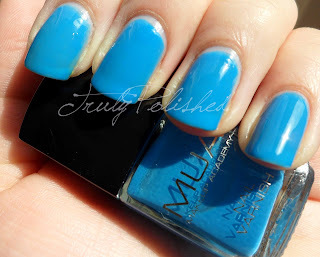 I actually really like MUA nail polish, it's so cheap and the bottles are a half decent size at 6.2ml. Shade 9 (don't you just love that imaginative name...) is a true blue creme. It went on like a jelly and I got a bit excited, but in reality it's just a very sheer blue creme! The application on this was pretty good considering it's so sheer. I used 3 coats and you couldn't see my nail line in real life even though you can in the photos! This colour is really nice for spring if you'd like a break from the pastels! Buy it here at Superdrug online or in store when it retails for the bargain price of £1! I can't stress enough how much these MUA nail polishes are amazing value for money!!! As a side note, their clear polish is really nice to use as a base coat because it dries super fast... Who can say no for £1? !